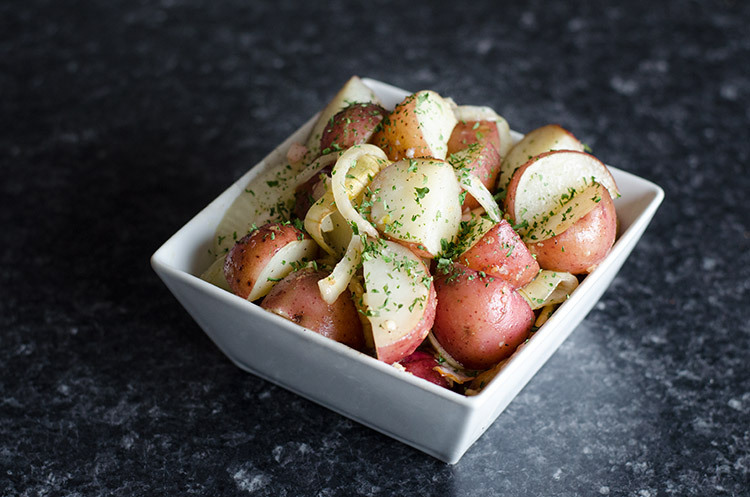 I’m still drooling over these garlic and onion roasted potatoes. Blame it on fall or whatever you want, but I have been craving potatoes lately like you wouldn’t believe. I put sweet potatoes in chili for the first time a few weeks ago and literally just about died from the deliciousness. 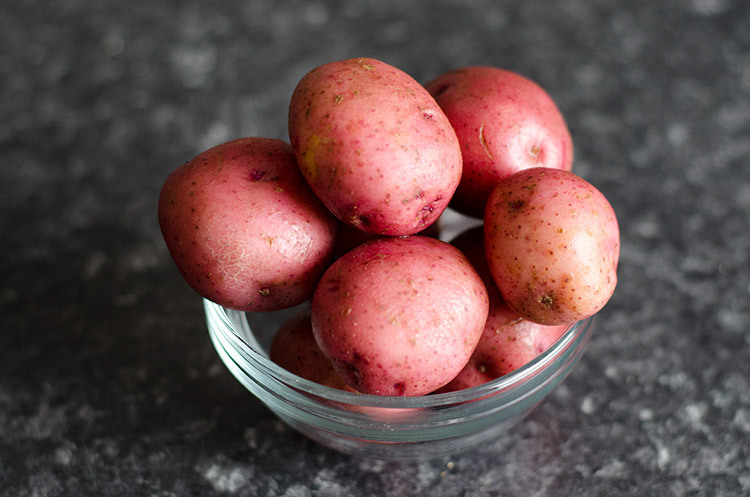 When I was a kid, I hated mini red potatoes, especially when they were cooked on the grill (sorry, Dad!). They had to be smothered in ketchup before I would even consider eating them. Now, I love them. Although this time around, I set out with a goal in mind: make them so good they don’t need ketchup, or any condiment for that matter. 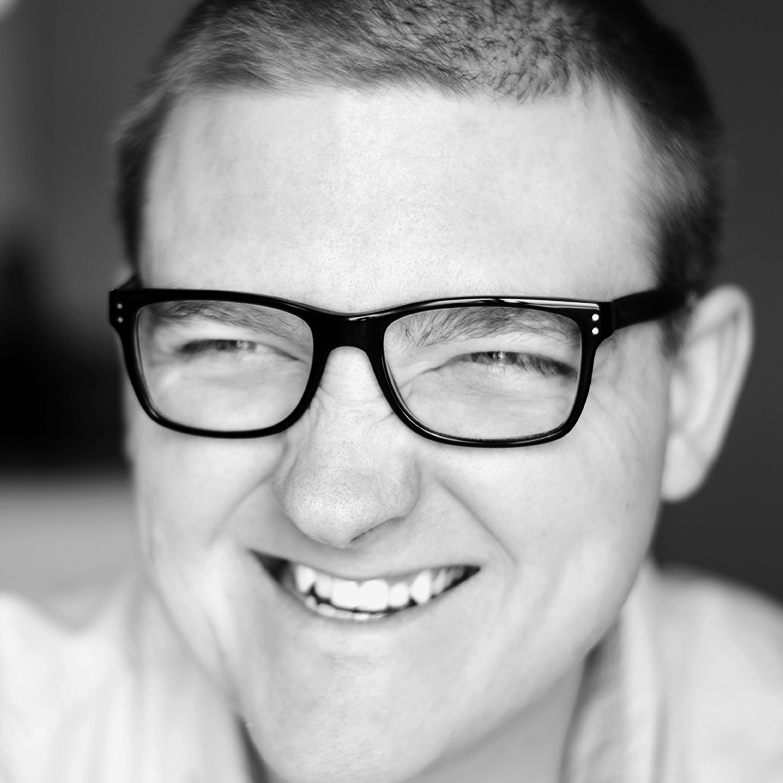 I think I pulled it off. The perfect blend of salt, pepper, and garlic really makes this recipe shine. I threw in an onion at the last minute to add another level of flavor from the roasting, and it’s awesome in this. I’m all for trying crazy new sauces that are infused with weird things like peanut butter or a lesser-known vegetable, but sometimes you have to appreciate the simpler things and go back to the basics. Salt + pepper + garlic = my perfect seasoning. Done. Here’s a tip: don’t over do it on the olive oil. The potatoes shouldn’t come out of the oven greasy or sparkling in the light. You want that wholesome, fluffy texture from the potato, not something that’s more watery or slimy. The 1/4 cup of olive oil in the recipe is the maximum I’d use. If you want to be adventurous, ease up on the oil and add in a little more garlic. Or, for an even better experiment, replace the olive oil with balsamic vinegar. These garlic roasted potatoes are the perfect side dish to nearly any meal. Serve with chicken, beef, or even fish. The kids will love them, too! Cut the potatoes in half or quarters. Place in a bowl with the olive oil, salt, pepper, and garlic. Toss until well coated. 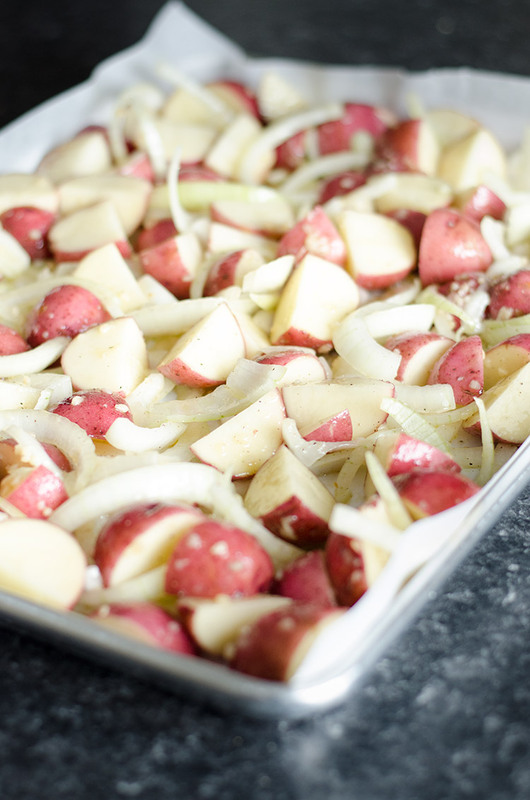 Transfer the potatoes to a sheet pan lined with parchment paper and spread out into one even layer. Roast in the oven for 45–60 minutes, or until browned and crispy. Flip twice during cooking for even browning. These look sooo good. 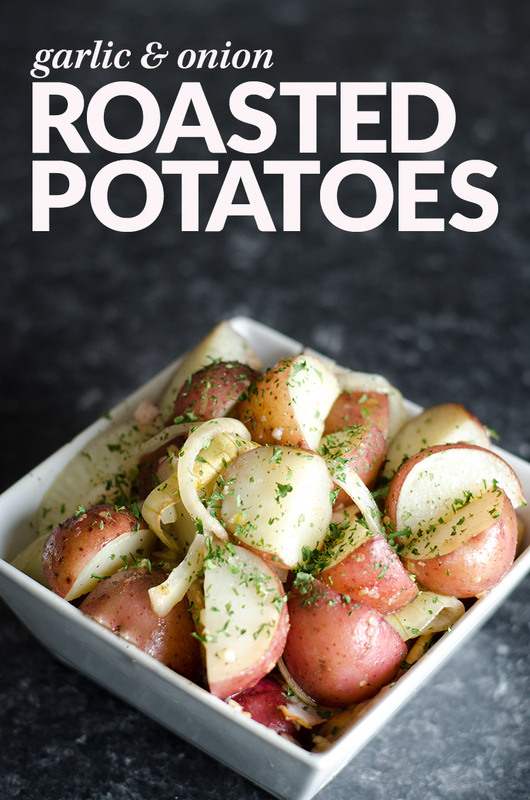 Nothing’s better than roasted potatoes – especially with onion and garlic! Love the idea of adding balsamic too. Aww, thanks, Rachel! I appreciate the comment, especially coming from you! Yum! I am making these tonight. Might add a bit of Parmesan since Ryan can’t live without cheese on everything.